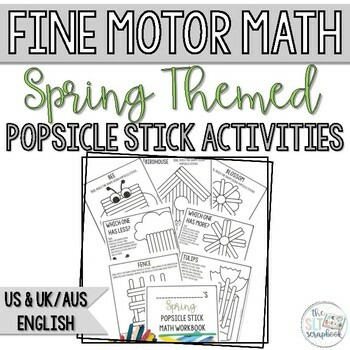 Keep your students busy and engaged while working on their counting and cardinality skills with this Fine Motor Math Popsicle Sticks Resource! This pack has a student workbook which is is completely no prep, black and white (low ink!) 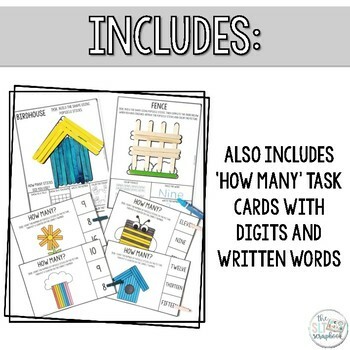 so you can buy and use the activities right away, and it also comes with two sets of 'How Many' counting and number matching task cards (one set with digits and one with written word). 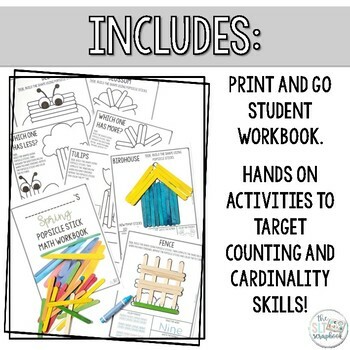 The activities are designed to be simple and hands on; great for independent working and math centers! Students need popsicle sticks, a pencil and some crayons (not provided). Instructions are included on each page; students build the shapes using popsicle sticks and complete the tasks. 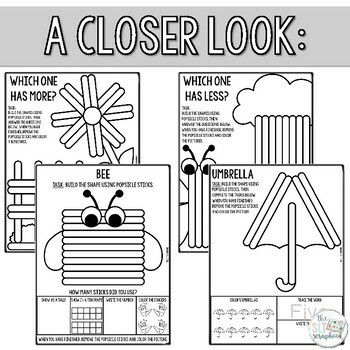 Pg 4- Popsicle Stick workbook cover. Pg 5-14- Build and Show pages. Pg 15-17- Which one has more? Pg 18-20- Which one has less? Pg 21-30- Build, Color, Trace, Write pages. Pg 31-35- Task Cards with digits (half pages- cut apart and laminate. Students pin clothespins/place a counter/squash dough onto the correct answer). Pg 36-40- Task Cards with word (half pages- cut apart and laminate. Students pin clothespins/place a counter/squash dough onto the correct answer). * This resource is suitable for use by US and UK/AUS therapists also- two files of each resource are included, please double-check which one you are opening as spellings will differ!